Possibly our favourite bar in the whole of Europe, this incredibly friendly backstreet bar in Zurich offers a choice of more than 1,200 rare spirits, all available by the glass, with a special focus on whiskies, bourbons and ryes from the personal collection of owner barkeepers Markus Blattner and Jvan Paszti. Apart from classic cocktails prepared by the two multi-award winners, they also specialise in serving some rare and forgotten mixtures alongside their own creations. We can't think of anywhere else in the world where you can enjoy a dram of 1963 Glen Grant 50 year old or 1964 Final Edition Bowmore Black Label 31 year old. There's a huge rum collection featuring the 50 year old Appleton Estate Jamaica Independence Edition whilst gin fans can sample the mega rare 1990s plastic bottle Tanquery Malacca and the much sought after Monkey 47 Distillers Cut 2011, alongside many others. Swiss beers, wines, whiskies and liqueurs are joined by a large Champagne collection and one of the best soft drink lists in Switzerland. Located in the Radisson Blu Hotel at Zurich Airport, this incredibly impressive bar is certainly worth visiting before or after your flight and, with trains taking just 9 minutes from Hauptbahnhof, it offers a great place to meet up when starting your night on the town. Centred around a huge awe-inspiring glass tower which houses over 4,000 bottles of wine and Champagne, the bar is open from 08:00 until 01:00 however the main attraction can be found between 18:00 - 23:00 (Monday - Saturday), as exquisite gymnasts soar around the spectacular glass structure as they retrieve each wine selection. They also perform headline shows with music, colourful lights and impressive acrobatic moves at 19:00, 21:00 and 23:00. The closest thing Zurich has to a secret bar, this impressive rooftop bar on the Bahnhofstrasse can be found by entering the discreet door to the right of the Modissa clothes store (during the day, you enter by walking through the shop). Take the lift up to the top floor and enjoy amazing award-winning cocktails, DJs late into the night and an atmospheric view of the local skyline and busy street below. Open daily until midnight (02:00 on Thursday and as late as 04:00 Friday & Saturday). Opened in 2014 on the 5th floor of Switzerland's largest casino, this vibrant 1920s inspired pianobar, club and restaurant boasts a beautiful wooden cocktail bar, electro swing music with musicians, and a terrace on three sides of the building which overlooks the rooftops of the city. Open until midnight daily (02:00 Thursday, Friday & Saturday). Originally opened by German poets Hugo Ball and Emmy Hennings in 1916 as a cabaret for artists and writers, this famous venue in the Old Town is the birthplace of the anarchic Dada art movement. Reopened and completely renovated in 2004, the famous "Säli" still plays host to over 150 events a year, although a fireplace now stands where the original stage was located, whilst an absinthe café features period furniture and serves a wide selection of alcohol and coffee alongside 16 absinthes, including their own 68% dada Absinthe. Downstairs is home to a Dada gift shop which celebrates the 100 year history of the political art movement, which started on this very spot before spreading famously to Berlin, New York and the rest of the world as most of its leading lights returned to their home nations following the end of World War I. Entering through a heavy wooden door, just a stone's throw from Belle Vue, you step directly from the street into this tiny legendary Zurich gem that has been a rendezvous for cocktail lovers since 1965 with regulars including Coco Chanel, Yves Saint Laurent, Pablo Picasso, Alberto Giacometti, James Joyce, Richard Strauss, Roger Moore, Max Frisch and Friedrich Dürrenmatt. Original artworks by Picasso, Matisse, Chagall, Braque and Mirò hang on the walls, comfortable green leather sofas sit around red marble tables with dark mahogany and brass fittings designed by Diego Giacometti, and the classic wooden bar serves exquisite wines and delectable international award-winning cocktails, including the "Ladykiller", which was first created here by chef de bar Peter Roth in 1984. This "temporary" urban garden, bar, restaurant, bike shop, vegan clothes store, and art and design shops is located in a collection of shipping containers in an area designated for a convention centre at the foot of the Prime Tower. It's obviously a hipster affair and changes throughout the seasons with a large outdoor terrace from April to September and a large wooden Winterstube gazebo from October to March. There's plenty of events throughout the year, and locals are encouraged to grow their own vegetables in the garden, which also produces food for the restaurant. With no confirmed date for its closure, it is open until midnight daily. How do we begin to describe this Zurich institution? A concert venue, culture house, two bars, a restaurant, popular lounge terrace and nightclub all rolled into one; it attracts some big name musical acts and DJs and is busy all day long. The building is divided into different areas with the Pelikanbar open from breakfast and gradually becoming a vibrant cocktail bar as the day progresses, right until 02:00 at weekends. Cocktails can also be had in Limabar, or out on the packed Terrasse, however the main highlight is in the beautiful old baroque theatre which plays host to live concerts and some of the best club nights in Zurich, which continue until 05:00. Nowhere in Zurich impresses as much as the glamorous pianobar inside the 5 Star Dolder Grand Hotel, which overlooks the entire city from up high on the Adlisberg. Originally built in 1899 as a health spa, it was renovated by Sir Norman Foster in 2004 at the cost of CHF 440,000,000, which is obviously being recouped in the expensive drinks prices. After walking through the breathtaking hotel lobby, you descend a stunning staircase to the plush bar below where you will find great signature cocktails, an impressive alcohol collection, live piano music (Tuesday to Saturday), monthly jazz evenings and various theme parties throughout the year which attract a monied crowd. The attached Saltz Restaurant boasts an amazing panoramic terrace and concentrates on Swiss wines. To get there, catch the funicular from Römerhof in the city centre up to Dolder (just 6 minutes journey time, with the last train up at 23:30). Open until 18:00 until 01:00 daily (02:00 Thursday to Saturday). Sadly the last train back is at 23:23 but it's only 1.5km walk or taxi ride down again. 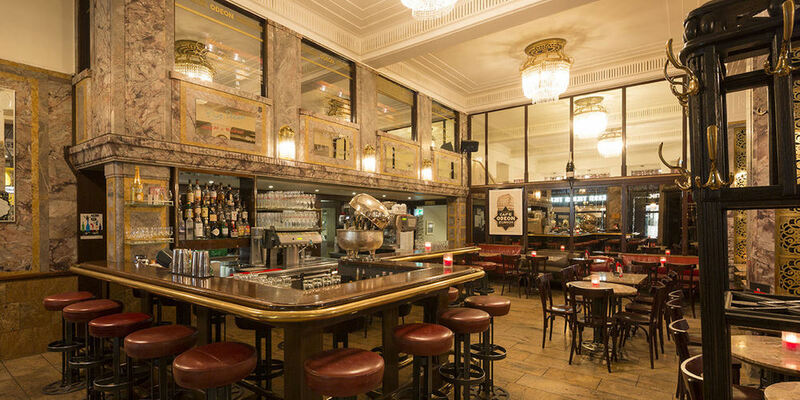 Perhaps the most famous bar in Zurich, the Grand Café Odeon, opened its doors on Belle Vue Platz in 1911, bringing to the city the style of Viennese coffee houses with its Art Nouveau interior, high ceilings and chandeliers. Whilst it's true to say the drinks are not as fancy as elsewhere in town, you can almost picture the likes of James Joyce, Albert Einstein, Benito Mussolini, Lenin, and Trotsky all propping up the bar or reading the daily newspapers in the corner, as they are all said to be regulars during their extended stays in the city. The venue is also celebrated as being the birthplace of Dadaism, with the founders of the art movement using the cafe as their headquarters in 1915. Later in its history, the bar became the first in Zurich to serve Champagne by the glass (or "Cüpli" as the Swiss call it) and, more recently, a popular gay bar. Today, everybody is welcome with both tourists and locals flocking here to admire the stunning historic interior and popular boulevard seating. Open all day, every day until 01:00 Sunday & Monday, 02:00 Tuesday - Thursday, and as late as 03:00 Friday & Saturday. This stunning bar and restaurant in Seefeld occupies an old cinema building from the 1920s, the first movie house in the city at the time. Completely renovated in the 1950s and later becoming an adult cinema before being left derelict until 2014, it was finally reopened as this grand wine bar, restaurant and romantic courtyard garden. Easily one of the most beautiful venues in Zurich, it is open all day long until midnight. Closed Sunday. Re-opened after extensive refurbishment in October 2017, this atmospheric jazz bar in Zurich's old town is famed for its alcohol collection. The bar's "Library of Spirits" has over 1,000 bottles with an amazing 500 different varieties of spirits, including over 250 types of single malt whisky. The cocktails are amongst the best in town and live piano music is performed most nights. This minimalist Swiss design wine bar from Yello frontman Dieter Meier can be found amongst Zurich's banks and insurance companies. Alongside Swiss cheeses, sausages and dried meats, you will find the owner's own Puro wines, one of the few organic wines awarded more than 90 Parker points. In addition, there is a good offering of exclusive European producers, also available by the glass. Perhaps the most quirky bar in Zurich and one for the alternative crowd. Located on an island where the Schanzengraben and Sihl rivers meet, it is themed as a pirate ship, with a large skeleton hanging from the roof watching over people sharing fisherman's tales. Live music, football screenings and a popular summertime terrace make this an incredibly popular place. Open until midnight daily (02:00 Friday & Saturday). One of the most popular Zurich Badis, the two anchored wooden bathing pools directly on Lake Zurich (one for men, the other for women) transform to become a popular bar after 19:00 May & September, and 20:00 June - August. The kiosk serves cold beers and basic cocktails with free acoustic concerts every Sunday, however it is the incredible lake view and the semi-naked fashionable crowd that is the biggest draw. You can build up your thirst with Stand Up Paddling and Stand Up Paddling Yoga too. Minimalist chic and some of the best cocktails in Switzerland can be found at this extremely popular Zurich neighbourhood bar. The intimate room is centred around the large bar, with spirits bottles hanging from above on meathooks. It can get extremely busy at weekends so get there early if you want to enjoy the cocktails in a more relaxed atmosphere. Open until 01:00 daily (02:00 Friday & Saturday). Closed Sunday. Opened in 2015 and serving until 03:00 Monday - Saturday, this cosy cocktail bar offers some of the best drinks in Zurich. Almost transporting you to a bygone era, the bar counter itself is set at table height, bringing you closer to the action as skilled owner bartenders Michel Kurtze and Wolfgang Bogner mix creative cocktails using locally sourced ingredients. No venue sums up Zürich West better than this retro bike shop, tapas restaurant and vibrant bar. Underneath pictures of famous cyclists, bike adverts and random decoration, old British bankers mix happily with young anticapitalist students, bearded hipsters sit alongside glamorous models and local regulars converse with the expat community. The former market hall may be all very shabby chic and the drinks choice rather basic - for which you need to join the queue to be served - but it's absolutely adorable in every way. The oldest bathhouse on Lake Zurich dates back to 1890 and is a stunning place to soak up the sun, swim in the lake and enjoy a drink in 19th Century surroundings. Possibly the most beautiful of the city's "Badis", the "Freie Sicht aufs Mittelmeer" ("free view of the Mediterranean") kiosk opens after the baths close at 20:00, from mid-May to the end of September, and there's regular events with movie showings, book readings and live music. Gin fans may already be aware of Clouds Gin, which is offered in many bars around the world. They are probably less aware that it is produced in partnership with this, the highest bar in Switzerland, at the top of the Prime Tower next to Hardbrücke, where the juniper is understandably heavy on the menu. However it is the stunning views of the city that most people visit this 35th floor sky bar for. Through the huge glass windows, you can watch the sunset over the Uetliberg, the lights slowly appearing over the city, whilst enjoying an excellent seasonal signature cocktail or one of over 200 wines. This intimate sky bar, popular with tourists, offers the most romantic panoramic views in Zurich. Just off the Bahnhofstrasse, take the elevator up to the 11th floor from inside Brasserie Lipp and enjoy a glass of wine or a classic cocktail as you admire the views over the Old Town, the lake and the Glarus Alps. Prices reflect the vantage point and are generally higher than elsewhere in the city. Whilst the cocktails may not be as impressive as some of the other bars in town, the gin collection at this hipster haven certainly is. With over 80 different gins to choose from, it is one of the best collections in Zurich. The venue itself, with its chequered tiled floor and minimalist copper bar is beautiful, with booth seating in the window and a downstairs bar for when it gets busy. Not actually a hotel (although there are two bedrooms available) but a popular bar on the ground floor of the landmark Prime Tower next to Hardbrücke station. Behind a long, narrow old wooden bar, which almost pulls of its Prohibition-era New York feel despite the large windows and high ceiling of its Banking-era Zürich location, you will encounter tattooed hipster bartenders mixing some of the best and most creative cocktails in the city. An additional bar upstairs offers more space and is a great place for holding events. Open until 23:00 Monday, midnight Tuesday & Wednesday, 01:00 Thursday, and 02:00 Friday & Saturday. Closed Sunday. Dating back to 1888, the stunning Art Nouveau Frauenbad Stadthausquai is an ornate women-only bathhouse on the Limmat River. A beautiful wooden structure, it should be high on your places to visit in Zurich if you're in town between mid-May and mid-September. Men are also welcome three evenings a week, as long as they remember to leave their shoes at the door, when Frauenbadi's bar hosts summer events. From 19:30 on Wednesdays they can enjoy free concerts, Thursdays from 20:00 the bar is open to both sexes and Sundays, from 20:00 until midnight, CHF16 gets you access to the open air disco with DJs spinning pop, funk and R'n'B. Serving what are considered Zurich’s best Martinis, from the Golden Fabergé to the Black Pearl Martini, this classic 15 metre long wooden bar inside the exclusive Baur Au Lac Hotel, at the lake end of the Bahnofstrasse, is one of the city's most high class bars. Excellent drinks, a sophisticated atmosphere and a perfect opportunity to see corrupt FIFA cronies doing their business. On a sunny day from April to October, this wonderful floating bar offers pure relaxation, unbeaten in Zurich. Located at the boat rental pier at Utoquai on Lake Zurich, you can enjoy cold drinks whilst sat on the pontoon with an almost Mediterranean atmosphere amongst palm trees, with the backdrop of the old town and the Alps. Launched in 2014, the concert hall, bar, and nightclub of ZHdK (Zurich University of the Arts), is the perfect performance venue for the students to showcase their talents. Most concerts are free and with a lineup that focuses largely on jazz, drum'n'bass and soul, you can make a whole night of a visit here with Zurich's largest outdoor terrace proving popular ahead of club nights, which roll on until 04:00. When the sun is out, there are not many better places to drink than Lake Zurich. This terrace bar offers some of the best views and its ship deck appearance gives you the feeling of being on the lake itself. Located up the red-carpeted stairway on the top floor of the popular lakeside restaurant, dark woods, brass fittings and a small ship's library continue the nautical theme whilst the huge sundeck is the perfect place to enjoy the cocktails, spritzes and whiskies. Open daily April to September until 23:30. Located in the landmark Schiffbau building at Zuri West, this famous jazz club hosts concerts covering all genres of jazz, funk, soul, blues, electro and world music from top-class musicians. At the stylish bar, musicians and fans mix after the gig as DJs host late night parties. This legendary cocktail lounge in the former Grandhotel Bellevue is perhaps the most famous restaurant and bar in Zurich. Whether it's for coffee over the morning newspapers, an aperitif after work in the garden or a late night drink, propping up the bar amongst the glamorous guests, the monied locals of Zurich seem to flock here all day long. Today there's live piano music on Sundays and Wednesdays and a restaurant which appeals to the bankers and hedge fund managers, which seems at odds with the building's past when it acted as the meeting place for Lenin and his comrades, as well as the avant-garde Dadaists, who, in support of striking waiters, moved across the road to Cafe Odeon (above). According to French artist Hans Arp, "Tzara invented the word Dada on 6 February 1916, at 6 p.m... it happened in the Cafe de la Terrasse in Zürich, and I was wearing a brioche in my left nostril." Open everyday until 02:00 (midnight Sunday, and 01:00 Monday & Tuesday). Open from mid-May until mid-September, this is perhaps the most hip of Zurich's famous "Badis". Enjoy a drink at the Primitivo beach bar, swim in the Limmat river with 400m of reserved waters, sunbathe on the wooden decks, have a game of boules or beach volleyball or head over to the opposite side of the water for the diving board and Badi Bar. Open until 20:00. Cash only. This men-only city cente "Badi" is the oldest in Zurich, dating back to 1824, and offers enclosed swimming alongside the old city walls and Alter Botanischer Garten in the Schanzengraben moat. In the evening, from 17:00 until midnight, the Männerbad also welcomes women as the waterside bar opens its doors from mid May until mid September. The bar also hosts a popular vintage second hand clothes market every Monday evening in July and August. Cash only. In the glass cube building which makes up the top floors of the landmark Schiffbau building at Zuri West (above Moods bar), you will find this cocktail lounge set over two floors and offering a view over the surrounding rooftops. Classic cocktails, a piano, fireplace and DJs are good enough reason to visit. Open until 01:00 during the week (02:00 Friday & Saturday). Closed Sunday. This neighbourhood hipster bar, just north of the city at Wipkingen, seems to be permanently busy and seats, both in the bar and pleasant summer terrace, are at a premium. DJs, live bands, book readings and football screenings add to the appeal. Open until 01:00 daily (02:00 Friday & Saturday). Located in three buildings of a former brewery, this live music venue, bar and bathing area on the Limmat River, near the gardens of the Swiss National Museum, has been a youth centre ran by the City of Zurich since the 1930s and, alongside factory workshops, promotes subcultural events. The bar and concert areas are open all year around, together with a restaurant specialising in vegetarian and vegan dishes, however it is in summer when the venue really comes to life with the locals flocking here to swim and drink by the river.